This is a simple, little coin purse, but it has an amazing story. The women of Clothed in Hope, all vulnerable women who have completed or are currently walking through our skills-training program, are so very grateful for our partnership with Fair Trade Friday/Mercy House. The first time I told them about our big order for coin purses to reach the homes of over 500 women across America, over 60 women cheered, screamed, danced, rejoiced. Because to them it's not just some extra money in their pockets to feed their kids or pay school fees. It's empowerment, it's someone who says "I believe in you. I am with you." It gives the message to these ladies, overlooked and oppressed by society, that they are worthy. That they have something beautiful to offer the world, a skill and a story that can inspire women thousands of miles away. Each product made for Fair Trade Friday boxes, from coin purses to earrings, is a way for women to rejoice in their story of hope and redemption that they've written as a part of our sewing and business training program in Lusaka, Zambia. I love knowing the story behind my coin purse. 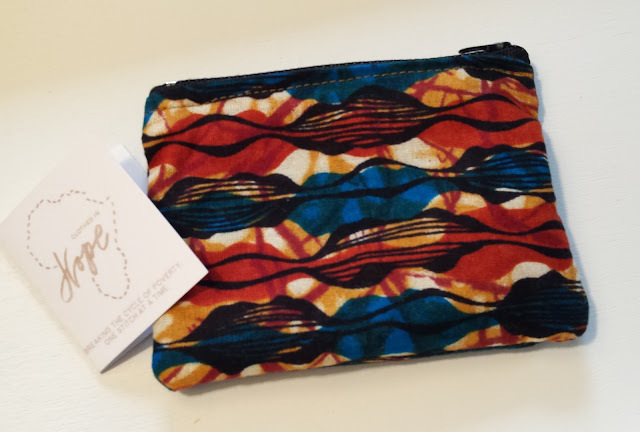 It thrills me to know that this coin purse, and the hundreds of others that were ordered for Fair Trade Friday, brought such happiness to the women who made them. Every time I use this item I will remember the joy that it gave to women in Zambia. And every time that I use the coin purse, it will bring me joy too! Maureen, the woman pictured with Regina on her back, is the brains behind much of our jewelry line, specifically a beautiful earring design headed out to women as part of the Earring of the Month Club. 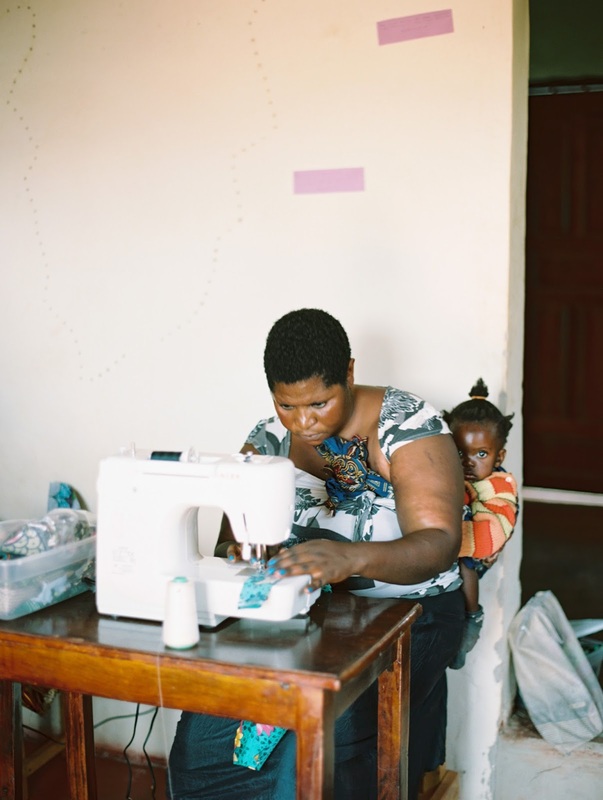 Maureen graduated our life-skills training program in September 2014 after completing a 12-month sewing and business curriculum with her daughter Regina on her back. Maureen is showing her children that work is good, and that no obstacle is big enough to keep her from pursuing her dreams for her family. I was privileged to be a part of the Fair Trade Friday club for a few months this year. I eagerly anticipated the monthly package! I have kept a few items for myself, and a few of the items have been given away as gifts. The rest of the items are sitting in my gift stash for Christmas and birthdays and other such occasions. I like to have at least a few gift items on hand for when a gift need arises. It saves me time and energy and money in the long run. Earlier this year when William needed a teacher gift, I let him look through my Fair Trade Friday stash, and he picked out a fun bracelet for his teacher. Fair Trade Friday is the perfect option for gift shopping when you are chronically ill and homebound! A variety of fun items come straight to your home, and you don't even have to think about shopping. Each Fair Trade Friday club package contains 3-4 fair trade products. Packages have a retail value of about $50, but only cost $31.99. Because Fair Trade Friday is run by volunteers, the package cost is minimal for you, and all of the proceeds go to the artisans around the world. And it is making a difference in the lives of women and their families around the world! If you missed my post on Monday, you can click here to read more stories of the impact of Mercy House and Fair Trade Friday. Are you wondering what type of items come each month in the Fair Trade Friday club? Here are pictures of the items from my monthly packages. There are a wide variety of items that come, and many of them are practical too! Each Fair Trade Friday package also contains information about Fair Trade Friday and includes gift tags to use if you want to give a Fair Trade Friday item away. 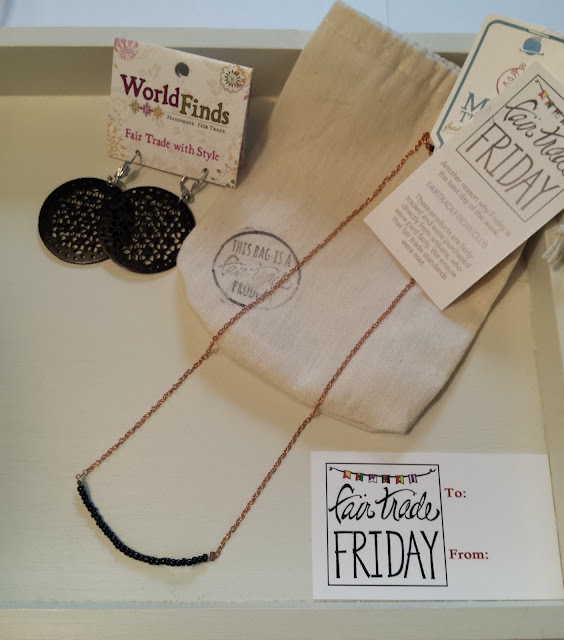 This necklace, earrings, and gift bag are fair trade items from India that I received in a one-time box from Fair Trade Friday. They are lovely, and I think they will make a great gift for one of you! If you would like to have these, please enter the giveaway using the Rafflecopter form below. The winner will be notified by email on Monday, July 6. 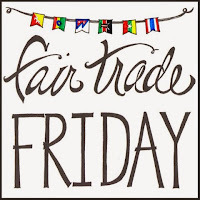 It has been an honor to tell you about Fair Trade Friday this week on my blog. Thank you for coming here to read about Mercy House and their new Fair Trade Friday club. 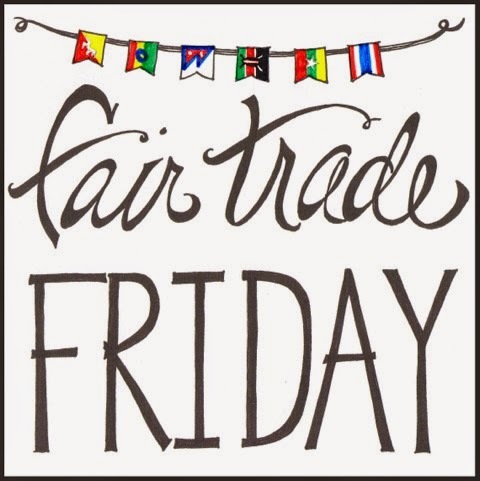 This summer I will be sharing some more about Fair Trade Friday on instagram, twitter, facebook, and pinterest. 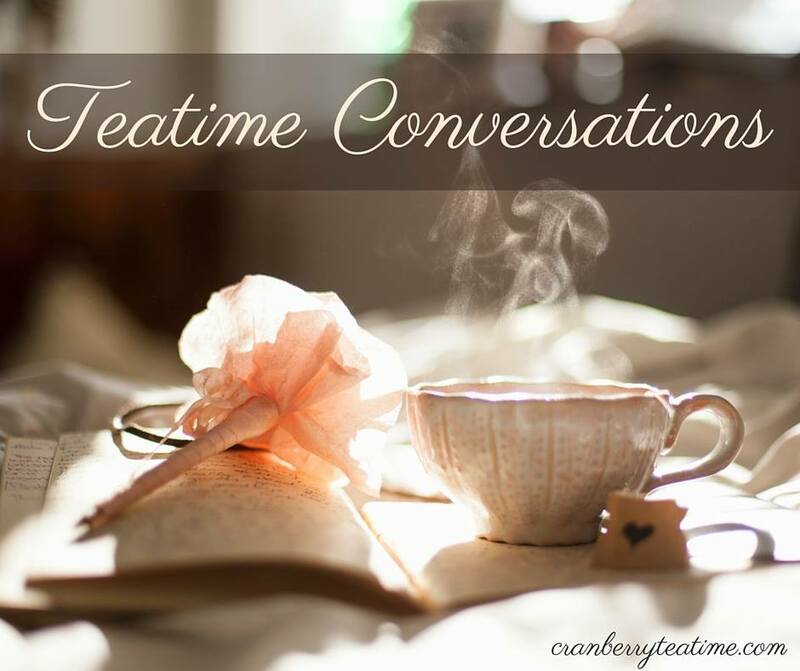 You are welcome to connect with me in those places and follow along as I share about my life, my faith, and my new favorite club, Fair Trade Friday! I have so loved your posts Rachel! Beautiful and hope filled! I love the paper heart Christmas ornaments...so lovely! Thank you, Kristin. Thank you for reading here, and thank you for your encouraging words. It has been a joy to tell about Mercy House and Fair Trade Friday this week. That's great that Whole Foods has similar coops and that you have been able to support fair trade in other ways. We certainly aren't all called to support through Fair Trade Friday! You are right that the monthly membership is currently sold out. Each month they add more more members, and it helps them to have a waiting list so that they can plan ahead with their artisan groups. I have always wondered about fair trade friday. thsnks for sharing. Love love! The coin purse story is one of my very favorites. I hope you receive the gray and yellow t-shirt for your birthday! Thanks for taking the time to read about Fair Trade Friday and the women who make these products! I was so excited to see you sharing about Fair Trade Friday! I have loved their mission from the first time I learned about them, and I am so happy to see their work being shared with others. What a wonderful thing! My favorite product is the Hand-Woven Kenyan Baskets. Beautiful. These items are beautiful! I'm going to check out the boxes now. Thanks for sharing! 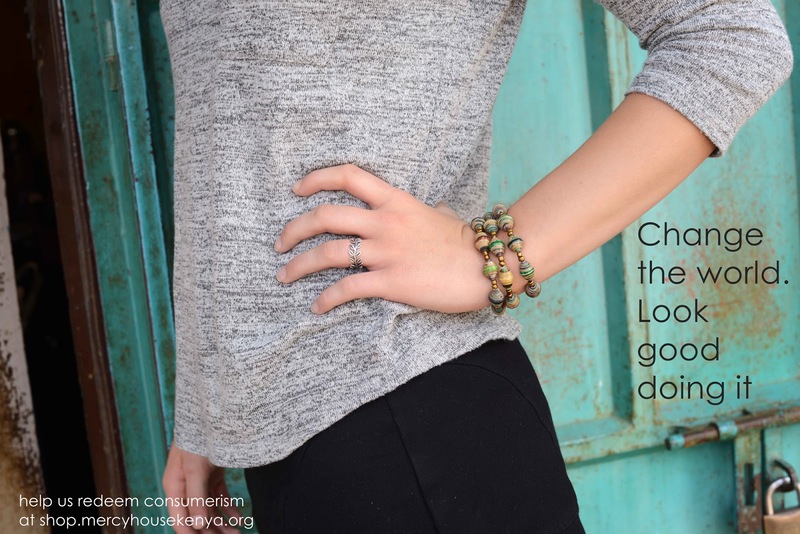 I love Clothed in Hope! Amy's heart for the women she works with is absolutely beautiful and I love bring able to see their passions shine through their work! Such a great way to break the cycle of poverty and share the love of Jesus! Thank you for sharing - I love the "your yes matters" t-shirt from Fair Trade Friday. Love the story behind the coin purse and all the stories that come from this amazing project! I love this! I especially like that they offer a kids box. The contents are adorable and I like that they include information about the artists to educate kids too. I really like Global Layered Bracelet Set.